WASHINGTON, Jan. 18, 2019 /PRNewswire/ -- Wounded Warrior Project® (WWP) announced support for Vail Veterans Program (VVP), a 501(c)(3) organization that rebuilds veterans' confidence through extraordinary, therapeutic experiences. WWP's $100,000 grant will provide summer and winter rehabilitative programs for wounded veterans, their caregivers, and their families. VVP's innovative programs help veterans regain a sense of freedom after catastrophic injuries, learn coping skills, and increase resilience through community and connectivity. "For veterans living with the wounds of war, the opportunity to develop a strong support system of fellow warriors can make the recovery process significantly more successful," said René Bardorf, WWP senior vice president of government and community affairs. "Vail Veterans Program excels at building a strong veteran community and delivering first-rate programs to meet the needs of recovering veterans. 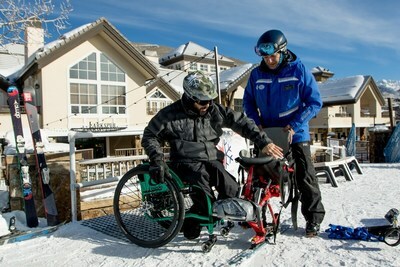 Our strategic collaboration with Vail Veterans Program will improve the quality of life for wounded veterans and their family members and help them regain a sense of adventure and accomplishment." "As we celebrate 15 years of service to our Nation's Heroes, Vail Veterans Program is proud to partner with Wounded Warrior Project to provide transformational programs for wounded Veterans, their Caregivers, and their children," said Lindsay Humphreys, Executive Director at VVP. "This partnership will lead to new and innovative experiences designed to build lifelong skill sets that provide resilience, confidence, and a community of mutual support. As we look to the next 15 years, Vail Veterans Program is dedicated to responding to the ever-evolving needs of those that have sacrificed so much for our freedom." Since 2012, WWP has partnered with over 120 organizations involved in the care of America's military community by providing more than $74 million in grants. To learn more about how WWP partnerships with organizations like VVP are improving the lives of millions of warriors and their families, visit https://wwp.news/Newsroom.